More articles in General BusinessWhere is this place located? 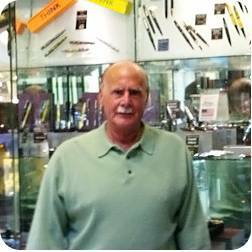 Business writer Jen Hickey recently spoke with Terry Wiederlight, the 66-year-old co-owner of Fountain Pen Hospital, a Manhattan retailer of fine writing instruments since 1946, about the secret to this family business’s staying power. JH: How has the business evolved from when your grandfather and father set up shop? TW: Our first store was located on one of the streets where the World Trade Center was built. The area was very different then. Radio Row was nearby, and there were many other types of small retailers on those blocks. Up until the 1970s, the focus of the business was exclusively on selling and repairing pens. With the shift toward mass marketing of pens, we started selling office supplies. When construction of the World Trade Center began in mid-60s, our store relocated nearby. We had many accounts with businesses there. By the mid-80s, 90 percent of our business was office supplies. Even though less than 1 percent of our business is now repair, as we sell/repair vintage pens, it never made sense to change our name, Fountain Pen Hospital, because that’s how people know us. We added the tagline “Showcase of Fine Writing Instruments” so people don’t get confused. My dad passed away before we switched back to pens. I wished he could have seen how we’ve kept the legacy going. He would have been proud. JH: How has the business changed since you and your brother took over? TW: In 1986, high rent forced us to move a little further uptown to our current location in Tribeca. When a Staples store opened up nearby in late 1980s, I saw the writing on the wall. We decided to go back to our roots. We are now one of the largest retailers of writing instruments in the world, carrying up to 50 brands and 4,000-5,000 models of pens—fountain, ballpoints, rollers. There were lots of inexpensive stores on this block back then. We didn’t fit in as a retailer of luxury items. But we made do. We were among the first retailers to go online in the late 1990s. That helped us reinvent the business. Today, 90 percent of our sales are through our website and catalog. JH: How did the Twin Towers attack impact the business and how has this area changed since then? TW: Just as we began rebuilding our business, 9/11 happened and we were closed for six weeks. We moved our computers off-site to take orders but our customers knew we couldn’t ship. When we were able to get back into the store, all we did was ship, ship, ship. We lost a lot of customers when the towers came down. But our online and catalog business certainly helped us get through that sad, dark period. This area has only been changing for the better. While it took a few years to get going, construction on the new World Trade Center has had ripple effect on the entire area. The retail offerings on this whole block have improved. We just re-did the front of our store and the business next to us is renovating its façade. It’s also become more residential. More families are moving in and raising their kids here. It’s a real neighborhood. JH: Describe your customer base and how that has evolved over the years. TW: We get business from all over. We get walk-ins, of course, and have always served Wall Street and Lower Manhattan. But the catalog and website is what drives our business. We get orders from all over the world, because there are not many other businesses like ours. We have around 75,000 people on our mailing list. We sell to business people, other professionals, writers, and even celebrities. 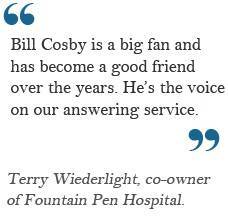 Bill Cosby is a big fan and has become a good friend over the years. He’s the voice on our answering service. JH: How has your business adapted to the new economic landscape after the recession? TW: Our business took a big hit in 2008. In response, we set up a section on the web site called Back Room, offering pre-owned, lightly used pens. It has been very successful. A lot of collectors are selling, so we re-purchase and re-sell. That’s helped us. Also, there’s Tuesday Mania, where we sell items on the web at special prices for 24 hours. As each item is sold, it counts down like the Home Shopping Network. We get roughly 5,000 people on our website most Tuesdays. We also host a Pen Expo twice a year at our showroom—one in December before the holidays, and one in the spring. Manufacturers come to explain and show their lines. We offer special pricing those days, and it generates a great deal of foot traffic and in-store sales. JH: What roles do you and your brother play and how has the staff evolved with the business? TW: My brother runs the front of the store—in-store sales/orders—and I’m in charge of all back office functions—financials, website, inventory. My father worked all the time, and I’m the same way, though I’ve reined in my hours in recent years. My daughter works part time in the showroom. I’m 66 years old, but I can’t imagine retiring. I love what I do.We’re open five days a week from 7:45 until 5:30, but the website is a 24/7 operation. We have 15 employees, who are constantly in motion. Every day, we’re updating the website and catalog. A few people handle all web/phone orders, and a few manage IT. About four to five employees are on the sales floor at any one time. We run like a machine. You have to be very organized when you’re handling so many products. Most of our employees have been with us for many years. I believe that has helped us weather all the changes and ups and downs. After Hurricane Sandy, we were closed for over a week and the phones were out for a few days after that. But we pushed on as we always have. Good help makes a business. © Copyright 2012 Bank of America Corporation. All rights reserved.